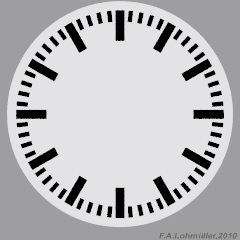 The hands of a clock are rotating with different speed. 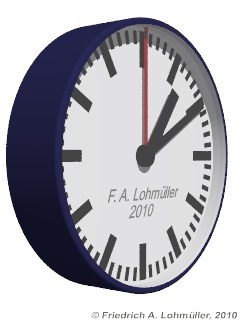 Cyclic animation of the hands of a clockface. While the hour hand turns 360 degrees just once in 12 hours the minute hand has to turn 12 times more = 360*12 degrees. And again the second hand has to turn another 60 times more = 360*12*60 degrees. We declare a basic time variable Clock_Time where we can add test values between 0 and 1. 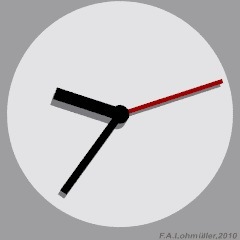 For a cyclic animation of a 12 hours turn of a clock we should take into account that 12 h = 720 min = 43200 seconds! 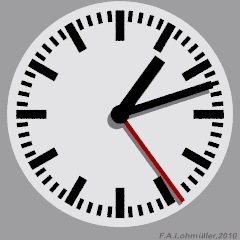 So for a small sized cyclic animation it's better not to use the seconds hand. To see the correct running of the seconds hand during a 12 hours turn we need an animation with 43200 frames! For the hands and marks we use flat cylinders. 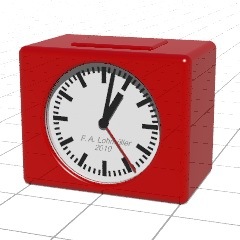 For more details of the clockface and the seconds hand and textures see the according scene file. Clockface: The marks for hours and minutes.